It's been an up-and-down year for Master's FA Saints, but the club seems to be peaking as the season enters the final stretch. According to keeper Shane Lopez, the club has finally learned what it takes to compete in League1. The Saints entered the season with a two year plan to excel, and Lopez says they are on track to meet their expectations. "We struggled a lot with our maturity and inconsistency early," he said, "but I'm seeing a lot of improvement." A big part of that improvement is Lopez' play. Although just twenty-five, he has emerged as a true leader of the side. A pair of solid results last week - including a clean sheet in league play and an upset over Sigma FC in the cup - lead to Lopez being named player of the week. Lopez says his focus is less on his own game than on those around him. "I focus on the little details. Someone once told me that if 'you don't control the game, the game will control you.' I take that to heart. I try and make sure my back-line is doing the little things right." Still young by keeper standards, Lopez says he still aspires to take as game as far as he can. However, he says that it's somewhat out if his hands. If League1 is the pinnacle then he's happy to have had the chance to be involved with the league. "I've been impressed with the talent level," he says. 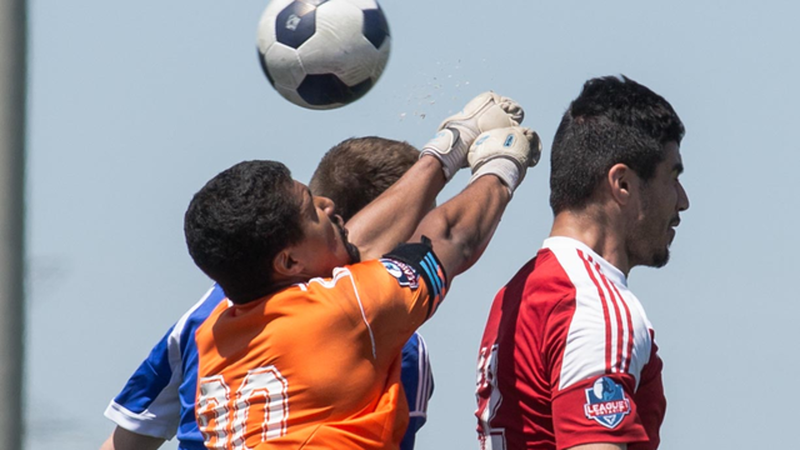 "Especially when you play teams like TFC Academy, Sigma and Vaughan - it's a real challenge." Lopez stressed the importance of the coaching he's received throughout his career - he singled out Randy Olsen, Leon Williams and Bayete Smith as having had a great deal of influence on him - in helping him understand the game. "I am always looking to get better," he said. He added that he hopes to be a part of MFA in 2015 to see out that two-year plan.